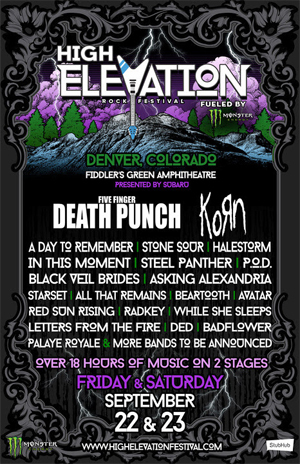 The full lineup for High Elevation is as follows: Korn, Five Finger Death Punch, A Day To Remember, Stone Sour, Halestorm, In This Moment, Steel Panther, Black Veil Brides, Asking Alexandria, Starset, P.O.D., All That Remains, Beartooth, Avatar, Red Sun Rising, Radkey, While She Sleeps, Letters From The Fire, DED, Palaye Royale, Badflower and more bands to be announced in the coming weeks. Fiddler's Green Amphitheatre presented by Subaru is located at 6350 Greenwood Plaza Boulevard in Greenwood Village, CO, just outside Denver. For more information on the venue, visit: www.fiddlersgreenamp.com.